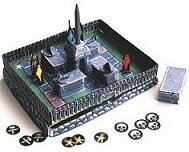 In this game, you're one of four Banshees racing to collect five skulls from the surrounding tombs. Standing on the red-stained stones (I suspect the stains are from tomb leakage), you perform the mystic ritual of 'Spinning the Bones' to overcome the magic spells of the Stone Sentinels (which keep the tombs closed). Next you peer inside the tomb, hoping to find a skeleton (and hoping not to find a Vampire). Relieved to see only bones, you grab the skull. But then you notice the horrible Zombie lurching towards you. Sounds like fun, doesn't it? To build this game, you'll need a POSTER BOARD (any color), a PAIR OF DICE, a pencil, 4 pennies (or other coins), and you might use four or five toothpicks. You'll also need glue, tape, scissors, an X-acto knife, and a straight-edge(ruler). When you've gathered the above items, print out the assembly instructions, the game rules, and the parts pages, all of which are listed below. And let the skull collecting begin!